Yikes! If discerning fact from fiction is this challenging for adults, imagine what it's like for children. Teaching students the importance of source evaluation lays the groundwork for media literacy skills and begins to plant the seeds of healthy skepticism. Did you see a leopard yourself? Where? Did you hear about it from another person? Did you see it on an iPad or on the TV? 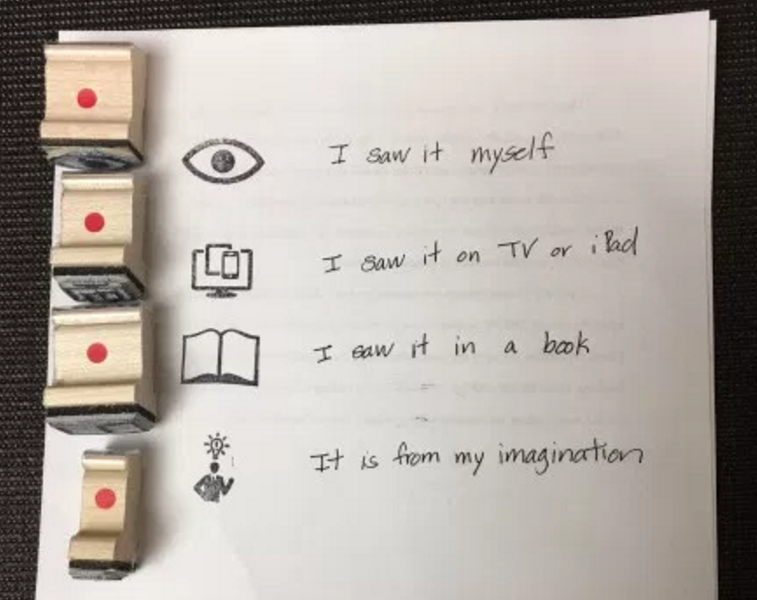 For assignments in writing, Wee takes this a step further by asking students to use simple stamps to show their information sources. Questions like these make students aware of different kinds of sources and pave the way for a more thorough evaluation and citation process later on. When students are in the Middle School, we ask them to evaluate information based on its currency, relevance, authority, accuracy, and purpose. In high school most of them will be introduced to these concepts in the form of a handy acronym, the CRAAP test. I recently introduced it to Lowell’s 8th Grade Project of Discovery Class, and after initial giggles, students practiced applying some of these questions to the material they found. Currency—When was the information published? Is there an update date? Do the links work? Relevance—Does the information answer your question? Is the information at your level? Are you the intended audience? Authority—Who is the author? What are their credentials? What is their contact information? What is the site’s domain? Accuracy—Where does the information come from? Is it supported by evidence? Can you find the information? Purpose—Does the information attempt to inform? Teach? Entertain? Persuade? Is the information a fact or an opinion? Many high schools require students to fill out a “CRAAP sheet” or other evaluation tool for any resource used from the open web. With these tools of critical analysis students will be empowered to make informed decisions and not take any information or story at face value. It's critical that we help them develop information literacy skills at an early age in order to lay the groundwork for the critical thinking skills they will need for to evaluate the vast amount of information they will confront and civic engagement. Since all information is not created equal and learning how to evaluate sources is a skill developed over time, librarians at Lowell provide students with top-notch, credible resources to meet research needs. This is what INFOdocket chief Gary Price calls “Preemptive Librarianship." Lowell invests in subscriptions to online resources that can be used at school or at home with passwords. These are designed with school research activities in mind and provide a safe, trustworthy environment for students to look up articles and facts for class projects or to explore their own areas of interest. Students who initially balk at not being able to simply Google their questions also notice the improved quality of their work and appreciate getting the information they need. Furthermore, they are becoming adept at using the types of resources that they'll be required to take advantage of in high school and college. All of these resources can be accessed via from Lowell’s online catalog’s Researcher Page. In addition to the subscription services, we have also included several free kid-safe search engines on that page. Encourage your children to bookmark the Researcher Page and keep the passwords handy! And, if you are not a Lowell parent, ask your school librarian about how they curate resources for students. The Explora Primary and Explora Middle databases give students a wide range of age-appropriate, vetted content from leading magazines, newspapers, and reference books. It has an attractive landing page with advanced search options as well as basic subject headings. Britannica online offers the basic subject coverage and reliability we associate with the print version of the encyclopedia but has the advantage of frequent updates and links to relevant articles, websites, images, and videos. It also has a read aloud feature. The EBSCO K-8 e-book collection provides a wide range of nonfiction books that have the added benefit of currency as well as online accessibility. Students can find these books through the Ebsco e-books portal or by searching Lowell’s catalog. Thanks to Lowell librarians Christine McDaniels and Annette Davis for reading an early draft of this blog. Melissa joined Lowell's library team in 2012. She holds a MLS with a concentration in School Library Media from the University of Maryland. Before becoming a librarian, she was an English teacher at Garrison Forest School in Baltimore. She graduated from Miami University in Ohio and holds a MA in English language and literature from the University of Maryland.